The Troy Area Chamber of Commerce, originally the Troy Community Boosters Club, had its beginning In 1934 when the members of the club decided that their objectives could be better accomplished through the development of a true Chamber of Commerce. Records indicate that the first official board meeting was held June 27, 1939, and on August 31, 1944, a Certificate of Organization Membership was issued for Troy Chamber of Commerce, Ohio by the United States Chamber of Commerce. The first projects of this organization were concerned with the advancement of retail trade for Troy. On March 7, 1957 the Troy Chamber of Commerce was incorporated under the state laws of Ohio. The mission of this organization was to promote the civic, commercial, industrial, professional, and agricultural welfare of the City of Troy and vicinity. Today, the Troy Area Chamber of Commerce is an active advocate for business has a far reaching mission and works to protect our community?s economic base and improve the quality of life through the monitoring, action and communication on issues affecting business. The Troy Chamber is affiliated with the Ohio Chamber of Commerce and the United States Chamber of Commerce. 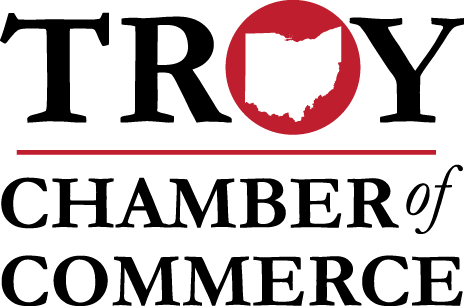 The Ohio and United States Chambers are recognized as advocates for business at the state and national levels. The Troy Area Chamber is one of only a few Ohio Chambers accredited by the U.S. Chamber of Commerce. Located in the Southwest quadrant of the public square in the ''405 building'' above Troy Sports Center.